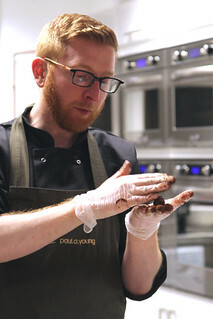 An invite to a chocolate truffle masterclass with leading chocolatier Paul A Young is a no-brainer! 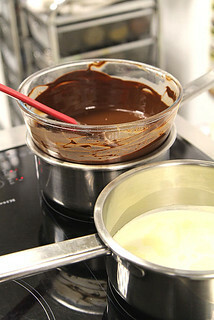 I do like playing with chocolate and I'll take any help going, especially if it's from one of the world's best. 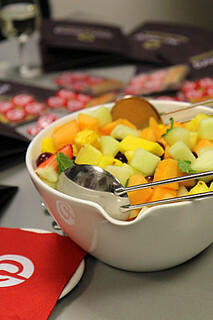 The event was organised by Pinterest UK and held at The Cookery School in central London, with help from Great British Chefs. 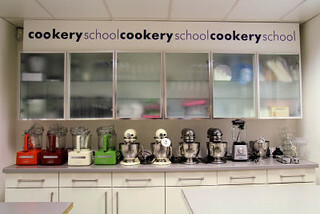 We learned about the different kinds of chocolate and cocoa beans, and also how to temper chocolate correctly at home. 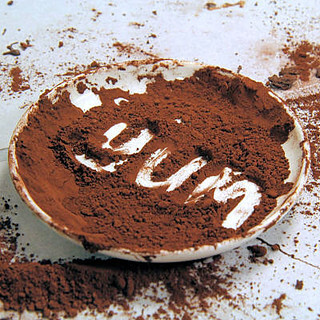 You don't need expensive equipment - a bowl set over simmering water to melt the chocolate, a granite or marble slab (cheap from a builders' merchant), plus a scraper to spread and scoop the chocolate up will do. 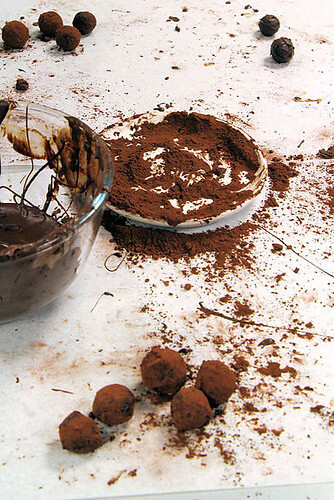 Something you won't be able to buy are cold hands, which are essential for rolling the truffle mixture into little balls! Apart from cold hands, you also need a cool kitchen, and when you've made the truffles or chocolates, don't store them in the fridge. 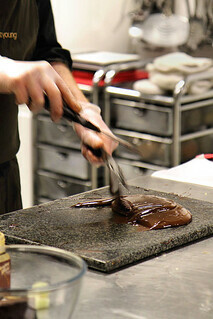 Properly tempered chocolate shrinks slightly, which helps to remove chocolates from a mould. We rolled out our own Port and Stilton Truffles ***YES! *** which were absolutely gorgeous. 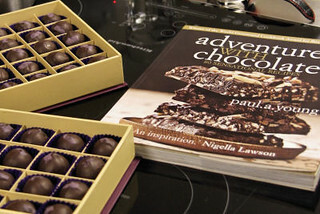 If you want to have a go at making them yourself, the recipe is on the Great British Chefs website, Port and Stilton Truffles. 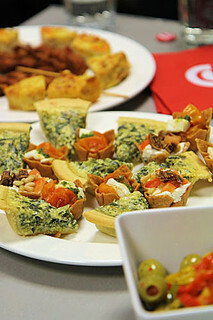 You can read Pinterest's own blog post here and see more photos on the Pinterest board Paul A Young recipes. 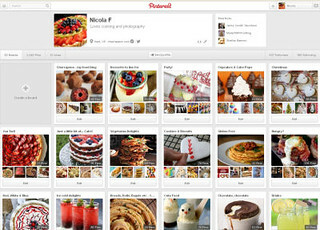 In case you're not familiar with Pinterest, it's a pinboard-style photo sharing website allowing users to create and manage theme based image collections including events, interests, and hobbies. You can search other pinboards and re-pin images to your own boards for safe keeping. I like to think of it as my creative inspiration boards, somewhere I can come back to time and again, to drool, gaze or just get fabulous ideas. I have 53 boards - mostly food boards - one is devoted to chocolate! Have a look, but don't blame me if you become addicted! 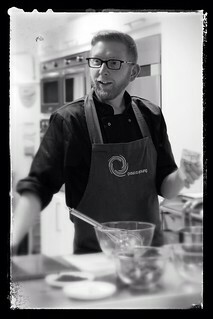 Thank you to Pinterest, Great British Chefs and to Paul A Young for the fabulous chocolate masterclass. Wow this sounds incredible! Especially those stilton and port truffles. 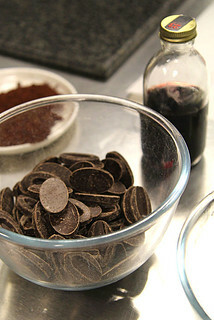 I'm so in love with chocolate right now and thinking about attempting to make my own chocolate from beans!